This is something I recently shared at A Creative Cookie. If you missed how to create a cool little travel case for your earrings made out of baby wipes lids, then here it is again! 2–Cut paper or fabric to cover the two lids (or “tops”) I used some scrap paper first to get the right shape, then traced it on the paper I actually wanted to use. 3–Using Mod Podge, glue the paper down onto the lids. Cover the paper with Mod Podge too. Let dry. 4–Place screen on one bottom, squeeze E6000 around the edge and push the other bottom down on it. Lay the whole thing on the table with a couple of heavy books on it until it dries completely. 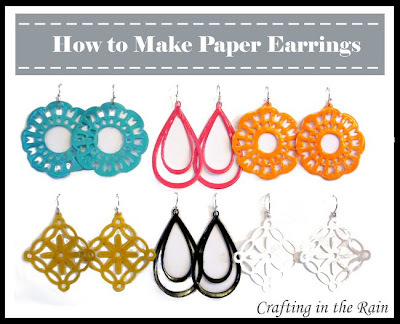 5–Pick out the earrings you want for your trip and stick them through the window screen. Secure posts with earring backs. The number of pairs that will fit depends on their size of course. But I think it would make a great “gift box” for earrings too. I have also shown how to make earrings like the one in my case.